The most common mistake humans make is thinking that a century is a long time. Extinction is apparently forever. Consuming something non-renewable is more important to me than, say, correspondence about dating and relationships. There is little going on today of more environmental importance than non-ferrous metal consumption. Consuming finite earth natural resources is something all humans have in common. But compare readership of "recycling" articles and blogs to, say, Jezebel's website. Many more people are obsessed with "crap email from a dude" - or CEFAD - and thousands of posts and sub-posts comment on these poor guys' nerdy correspondences to lost girlfriends. It's humbling. People seem more interested in what some lady's ex-date wrote in an email than they are in undersea mining and coral reefs. Those crap emails from dudes about wrecked relationships seem inexhaustible, but people seem fascinated. My obsession is about other wrecks (or wrechs, a new recycle tech term first coined here) ... I'm into recycling. I write endlessly about junk, wreckage, breakage, and scrap. The photo above is from 2002, when I toured a metal scrap shredder for automobiles at Guangzhou Iron and Steel, and arc metal furnace in Guangdong. They had purchased a large used auto shredder from the USA. At that time, it was a big deal. Since then the company has bought MBA Polymers, the USA plastic recycler, and has seen its own operation dwarfed by larger ferrous recycling investments, particularly in northern China. Hand dis-assembly. We can do this in Mexico, and Unicor can do it with prison labor, and of course they can do it in China. It means taking the printer or telephone or computer speaker apart and sending the plastic value to the plastic recycler and the metal value to the metal recyclers, and maybe catching a few reuse items (This week we sold a queer thing called a Power Technology Portable Fiber Optic Fusion Splicer for over $300 which someone pulled out of "breakage"). 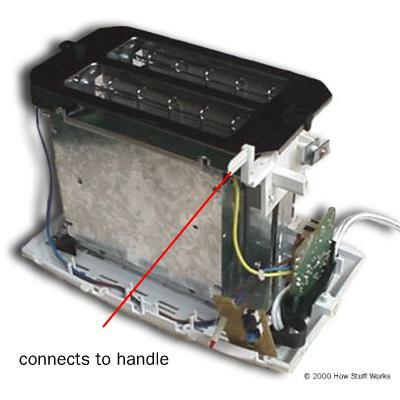 Not all hand disassembly joints are alike. 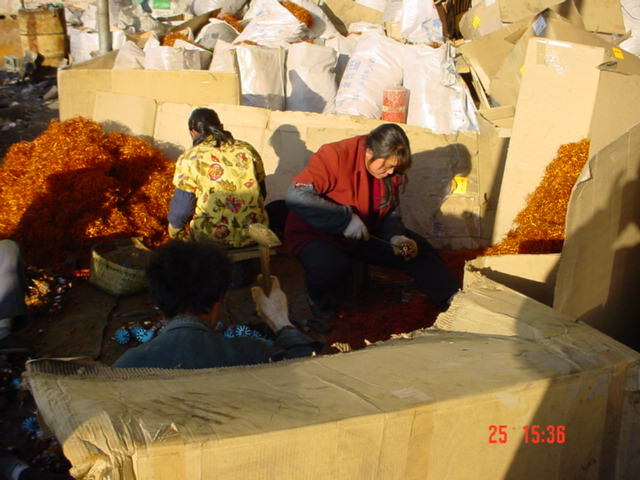 I have also seen Chinese women with razors carefully stripping copper wire by hand (photo). I was proud of them. 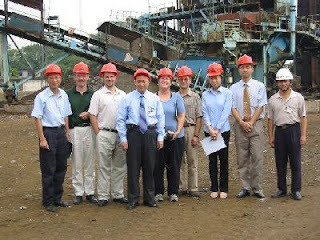 Recently Adam Minter commented on the relative success of women like this in the scrap field in China. It's not a job to be ashamed of. Shredding. Most of the shredders out there get the steel with a magnet and the aluminum with an eddy current. The plastic, the circuit boards, the copper all winds up in a pile of waste known in the recycling business as "fluff". Because of the way electronics are screwed together, a lot of the plastic and glass and boards stay on the aluminum and steel. What results is actually very similar to ZORBA scrap. If you look at it, it can have stones and plastic and wood and glass and debris all in it... but it is still richer in copper, aluminum than anything coming out of a metal mine. There are very high end shredders which can apparently get even circuit boards out of scrap metal, and there are ones which basically make big stuff smaller. Not all shredders are the same. But generally, the more clean they make the grind, the more carbon and energy they have to spend... there are diminishing returns on re-re-re-re-grinding ZORBA, and at some point the recycler or certification process has to make a somewhat arbitrary decision as to where to draw the line, how much plastic-shard per wire segment is enough processing. Then they need a law or a regulation to make people pay for their machine. Burning. This gets most of the anti-export film. It happens in this country, too. Burning wire to get the copper out is the ugliest recycling. There are 'materials of concern', i.e. solder and small boards on these items. The only thing that prevents it from being downright "bad" are the alternatives to recycling - throwing it away and mining more to replace it. A recycler told me she'd rather throw wire away then let poor people burn it. Having seen poor people without even copper to burn, and having seen virgin mining, I'd put burning down above "safe disposal", as a next to next to last resort. Another novel form of burning was done as a trial at our partner's smelter in Nacozari. Ten years ago, when they upgraded the office computers and copiers, they tossed them all at once into a 1200+ degree centigrade smelter furnace capable of getting out the copper, gold, silver, and zinc. They have a wickedly modern smokestack that estracts pollutants and extracts them into other raw materials... but it's probably not an efficient option. So... the rest of this post is about a common but unknown management practice. I didn't put it on the list above, because it could wind up to be any or all of the three. Just as our smelter engineers threw all the obsolete office machines into molten metal ore, most people in the USA throw a lot of different stuff - hair dryers, lawn mowers, spent PCs - into scrap metal bins. When those items are collected at a one-day event, they are called e-waste collected, but when they are thrown into a scrap metal bin, where do they show up in the numerator and denominator of MSW management? Here is a reminder of a post last spring, the "Toaster Recycling Test", describing the 'materials of concern' on a toaster. Toasters have pretty high failure rates, they have copper and little circuit boards. Not many are handled as 'ewaste'. Pound per pound, however, it would be pretty difficult to tell a shredded ton of toasters from a shredded ton of VCRs. When the electronics and electric appliances wind up in the river of scrap steel, with the bikes and file cabinets and cars, they are heading to an unknown - their numbers are diluted in a river of steel, and they become a statistical footnote. There is so much steel out there, a lot of recyclers just throw telephones, printers, computers and even monitors into scrap metal bales. All the e-waste in the country could be diluted into all the steel and it would go "away" like bike tires and plastics in an old fridge. Like in Goodfellas, you can throw bodies into the trunks of cars at the auto yards, why not a TV or a dot matrix printer? Would it surprise or shock any of us to find toasters and VCRs in America's #1 export - scrap ferrous metal? ISRI does an amazing job bringing legal terminology to a chaos of devices and publishes the bible on scrap metal terminology. 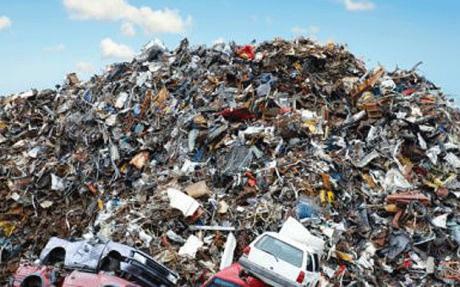 In fact, many of the CPUs and printers and other scrap I saw in China were being pulled out of bales of scrap steel. Huge quantities of scrap ferrous metal arrives in the port of Hong Kong. The CPUs and microwaves and printers and other machines arrive inside loads with cars (which have their own computers in them now) and white goods and lawnmowers, etc. What really confuses people is when the Price of ABS and HiPS plastics pass the price of metals, as happens more and more frequently. Then Chinese will pay a lot more to keep the plastics out of the shredder, figuring they can always sell the metals afterwards. I will write a totally separate post about plastics recycling in China. Here is a photo of a Chines plastic recycling business for electronics plastic. "According to the latest statistics released by the United States International Trade Commission, the country's ferrous scrap exports totaled 2.03 million metric tons in September, increasing by 31.19 percent year on year and down 13.72 percent over August. In September this year, the US' largest ferrous scrap export market was South Korea, with exports of 511,993 metric tons. South Korea was followed by China, with ferrous scrap exports of 384,500 metric tons, and by Turkey with 309,160 metric tons. On the other hand, in the January-September period of this year the US exported 17.33 million metric tons of ferrous scrap, down 1.15 percent year on year. In the period in question, China imported 5.16 million metric tons of ferrous scrap from the US, Turkey imported 2.77 million metric tons from the same source, while South Korea imported 2.49 million metric tons." When the PCs are shredded by poor first generation shredders, they can be more easily sprinkled into this outgoing ferrous metal. My point is that the number of containers of "obsolete" PCs blended in with good and repairable equipment must indeed be improved on. But if no one is providing numbers or data, we don't actually know whether bad apples inside repairable PC loads is as bad a problem as the obsolete scrap going into scrap steel bales, shredded or unshredded. Whether or not WR3A's loads could be improved from the 15% recycling rate, the 100 containers per year we export would yield 15 containerloads per year of recycling. 1% of steel scrap is a lot more than 15% of good computers. "The needed raw materials of this project product are the waste automobile, waste machinery, building materials, waste machinery equipments, dismantled ships and steel scraps in the society and so on. Along with the development of iron and steel industry, the existence of steel scraps resources in the society as well as the increment of the waste ships and automobiles have provided large amount of resources for the recycling and processing of steel scraps." In my opinion, the much of the current recycling story is "man vs. machine", a John Henry ballad about which will happen first, a shredder which doesn't ruin the plastic and copper and reuse, or a sweat shop with an air conditioner which people trust not to set stuff on fire. When the USA does it by hand, we use immigrants, prisoners, retirees, charities... I think it's too tough to call, some of the newer shredders look impressive, and the notorious non-transparency of the scrap dealers in China is maddening. But from the past decade, I'd say the hand dis-assembly wins environmentally. And it's a much higher job creator, and tends to capture more reuse. WR3A has been labelled a "reuse" organization. The fact is that we focused on reuse first because the technicians overseas are the farthest from the racially bigoted stereotypes that it was easiest case to make that organizations like BAN had painted exports with too broad a brush. The case for "export for recycling" will be more difficult, as companies with shredders that work better raise the bar on certification standards from the decade-old shredders which simply require the ZORBA etc. to be re-sorted overseas. As Chinese companies like Soundera and ARMCO continue to invest in their own high-tech shredding operations, the lines will be further blurred. In five or ten more years, when everyone knows that China is generating most of its own "e-waste", when China and India and Brazil are OECD countries, and when most of our computing power is in a cloud run from our cell phone (or wristwatch), a lot of this debate will seem archaic and quaint. The blogs about dudes who write crappy emails to ex-dates will probably be more relevant. The only question is how much rain forest and coral reef we preserve over the next ten years while filling the insatiable demand for metals and plastics. Anyone who gets in the way of recycling will have blood on their hands, and if they got in the way of affordable recycling with lies, they will got a lot of 'splainin' to do. My 2004 proposal for UNICOR still stands. Rather than complain about Unicor, the federal prison industry recycling program, why not send them all the keyboards and printers, the things that even owners of big shredders cannot want to process? It would keep them busy, which is really all that the Unicor program is asking for. Unlike computers and monitors and TVs exported for reuse, tracking plastics and metals disassembled by hand is really, really hard to document and certify. I'm confident our Mexico operation is doing it right, but I also know how hard it is for us just to verify data on the factory we own. It's really hard to track your commodities around the world. People surprise you. First surprise, Arkansas hillibilly named Mr. Fire Cloud is building a genuine French castle within an hour of my parents' home in Searcy county. See today's NYTimes. Can You Guess Where This Paper Mill Is? We real geek. We tweek tech.